On New York’s Adirondack Coast, autumn is characterized by crisp golden leaves, abundant apple orchards, sugar-dusted cider doughnuts, and at least one or two basic pics snapped while frolicking in a pumpkin patch (#guilty). But not everything about this season is as cutesy-wootsy as it might appear upon first glance. No, beneath fall’s frothy, pumpkin-spiced surface lurks something more sinister – and I’m not talking about the spoiled milk in your latte! Alyssa and I are digging into Adirondack Coast history to unearth the area’s spookiest secrets. This blog marks the beginning of our 4-part series leading up to Halloween. Stop number one? 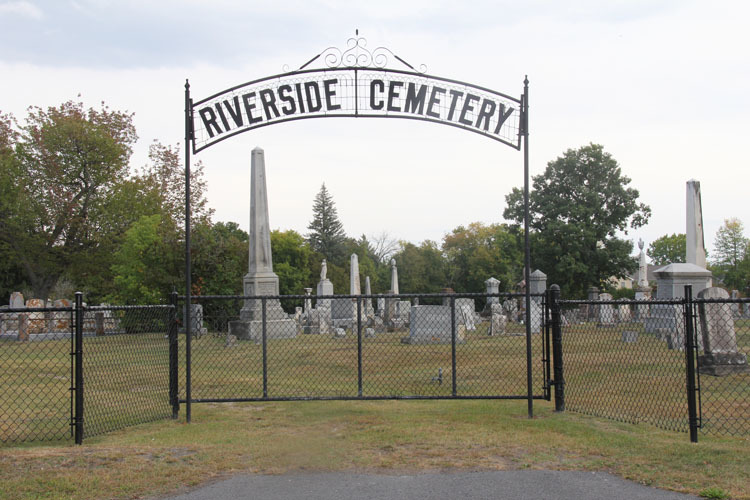 Riverside Cemetery, located right outside of SUNY Plattsburgh’s campus, heading south on Broad Street, just off of Steltzer Road. …and we did! Well, kind of. Matt Boire of "Greater Adirondack Ghost & Tour Company" gave us the detes. 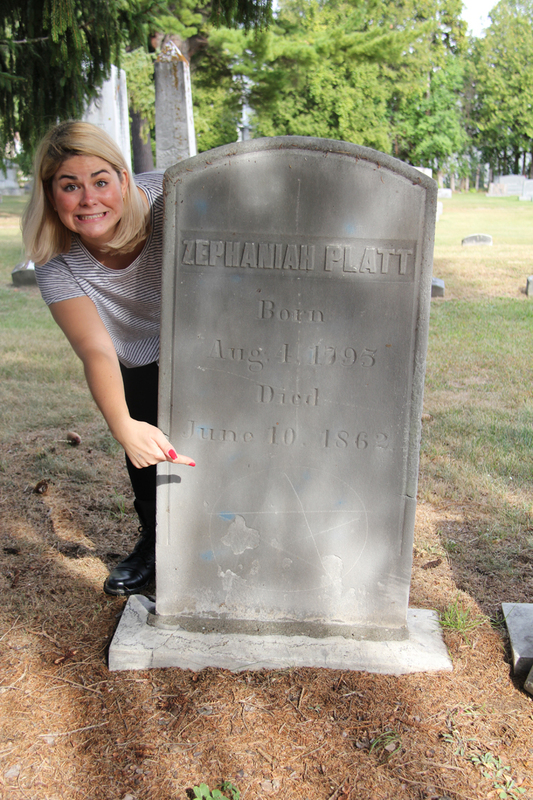 Apparently there were a few Plattses named Zephaniah, and all the family headstones are near this one. The one with the pentagram on it actually belongs to the founder's grandson. 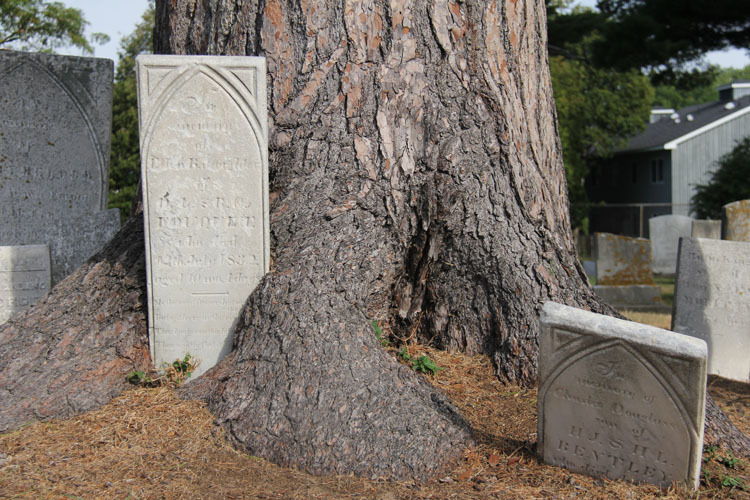 Matt says that while the headstones were relocated to Riverside from Zephaniah Platt's homestead, the actual bodies remain in the ground where they were originally buried. Which basically means Plattsburgh's founder is under an apartment complex somewhere... else. 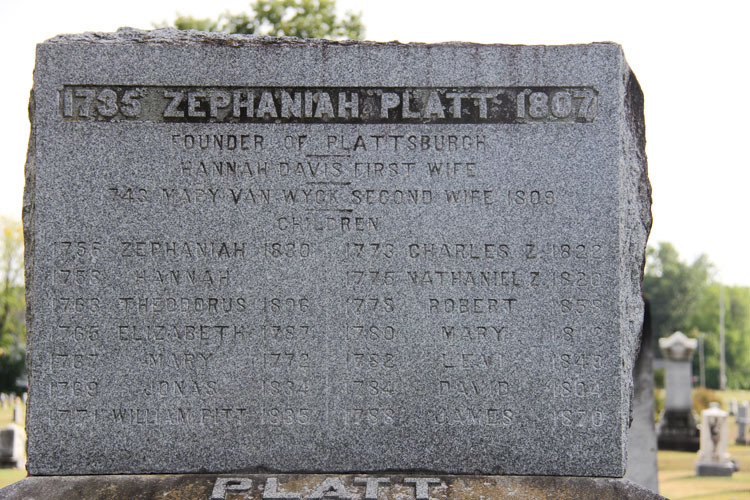 After spending some more time in the field, we were disappointed (but also a little relieved) to discover that no, someone was not actually trying to conjure up the ghost of the guy Plattsburgh is named after. Rather, some troublemakers were defacing these historic and truly very artful burial sites. It turns out, Riverside Cemetery has historically been the site of numerous acts of vandalism. But why? 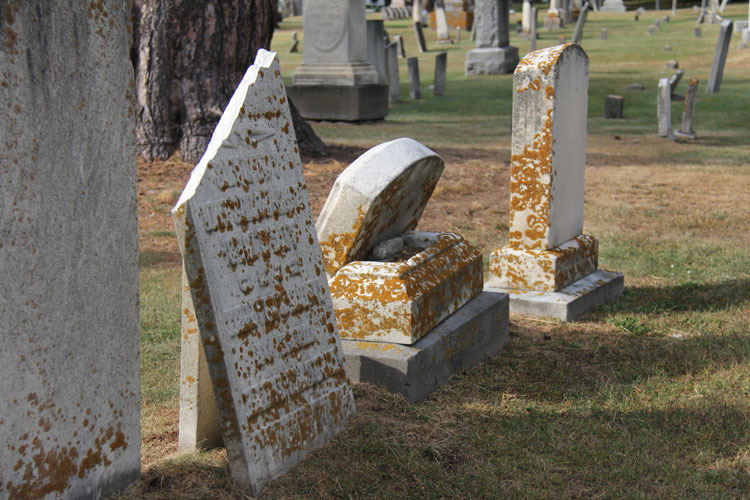 Local journalist and Ghosts of Clinton County author Gordie Little once wrote in an article for The Sun, “[I] find cemeteries to be like libraries, revealing much about those who came before.” This is true. 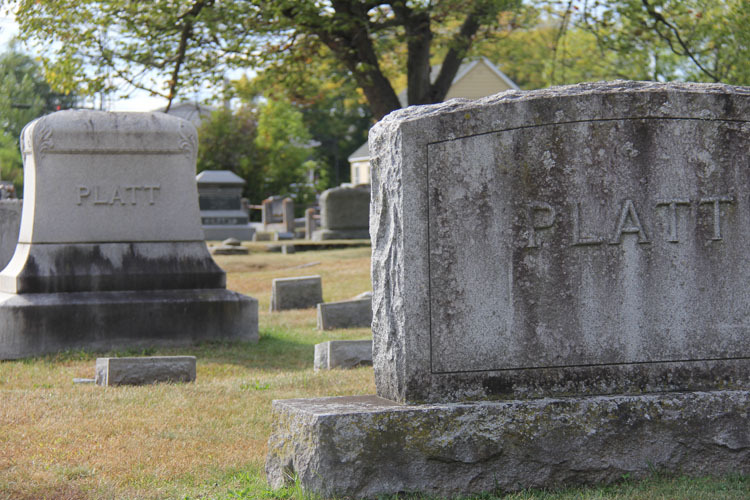 Walk from one end of the grounds to the other, and as you venture deeper into both the cemetery and time, it’s easy to imagine Plattsburgh’s rich history playing out before your eyes. Visitors will recall nearby street names on the stones as well as local landmarks, like the Kent-Delord House Museum. Students might recognize the names of campus buildings, like Macdonough Hall (more on that to come!). Maybe the intrigue lies in the number of local influential families buried here. 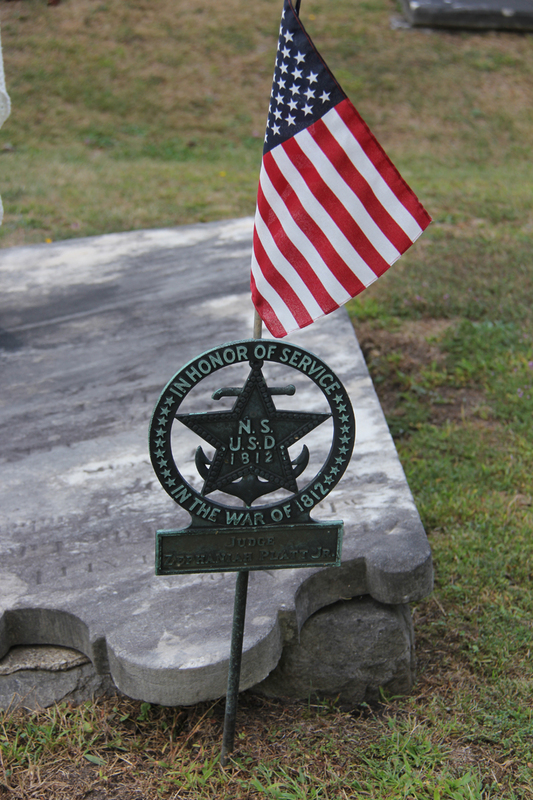 In fact, Riverside has even been the site of several Battle of Plattsburgh Commemoration events over the years, providing a place for visitors and locals to honor important pieces of the town’s treasured military past: its success during the War of 1812 and the soldiers who made it possible. Walking through the grounds, it's difficult to tell which headstones were turned intentionally and which have simply toppled over with time. Many of the ones at the end closest to campus – the oldest section of the cemetery – are eerily illegible. Others battle the natural forces surrounding them, refusing to surrender to the looming tree trunks and their invasive roots. So, aside from a few (very rude and inconsiderate) vandals, what is it that actually makes this spot legitimately spooky? On the outskirts of Riverside, just past the gates, there’s a swing set at a daycare built on the site near where St. John’s Catholic Church was once located. 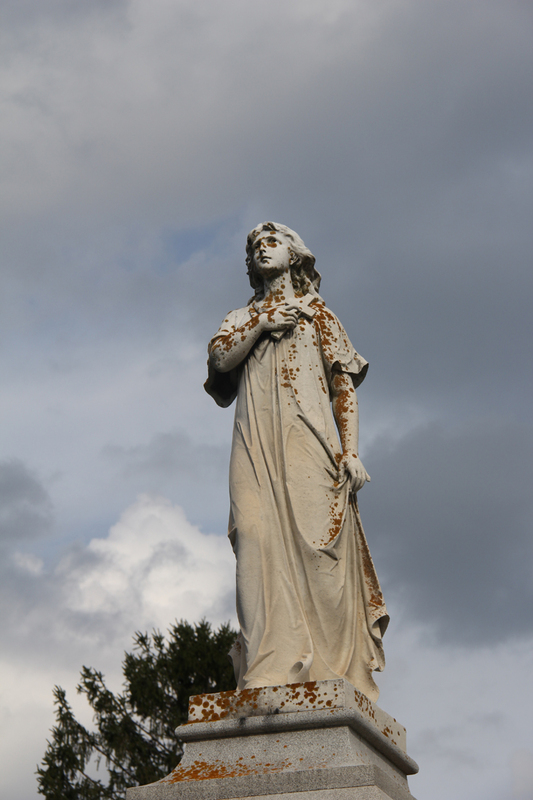 According to Ghosts of Clinton County, students often wandered to the cemetery from campus at night to investigate its sinister reputation – not unlike Alyssa and myself. In 2006, a number of students reported having seen movement at the swing set as they were leaving the cemetery just at the stroke of midnight. When they looked over, they saw a young girl casually swinging back and forth – an odd site so late at night. As they continued to approach the swing, she faded away, leaving the seat empty – but still moving. Does this mysterious girl still guard the site from vandals today? If I were a vandal, I certainly wouldn’t want to risk it! Can’t get enough creepy Adirondack Coast tales? Find copies of Ghosts of Clinton County for sale at Clinton County Historical Association (CCHA), located on the former Air Force Base.